The first decisive victory for the Americans results in disastrous consequences for Burgoyne. Battle of Bennington by F.C. Yohn. Battle of Bennington. Engraving, 1874, from painting by Alonzo Chappel. Photo courtesy of the National Archives. “The Country Seat of the Hon. 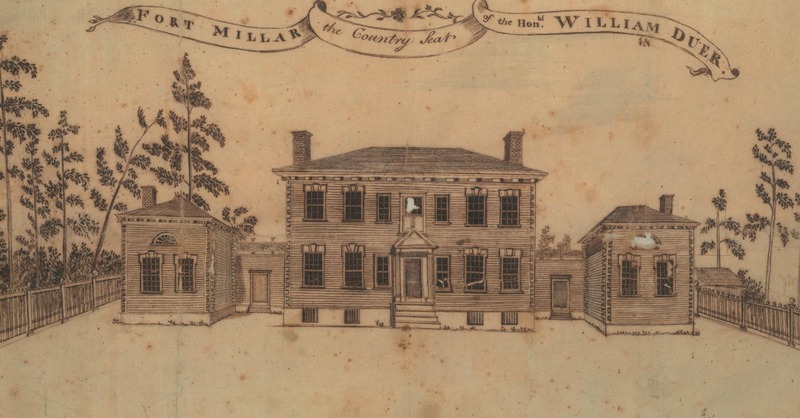 William Duer Ft. Millar.” Used with permission from the New York Historical Society. Looking North at Champlain Canal Lock 6. Courtesy of Marinas.com. On August 4, 1777, General Burgoyne ordered Brunswick Lieutenant Colonel Friedrich Baum to lead a raid for supplies at what was believed to be a scantily guarded Rebel depot in Bennington, Vermont. Baum’s force advanced on the supply depot on August 13. During their march they had gathered horses, oxen, and supplies, but did little in the way of recruiting additional Loyalist followers. Word had spread about the massacres of the Allen Family and Jane McCrea, and several families fled in advance of Baum’s force, which consisted of Indians as well as Germans, British, and Loyalist troops. They sounded the alarm and the militia were called out to oppose them. Burgoyne dispatched reinforcements, but it was too little too late. On August 16, inexperienced and outnumbered, Baum and his troops were overrun. New Hampshire Militia General John Stark hastily defeated Baum and his men. Baum was mortally wounded and his troops were taken prisoner. Aside from losing any advantage that may have been gained from Baum’s expedition, many of the Indians decided that it was time to leave. 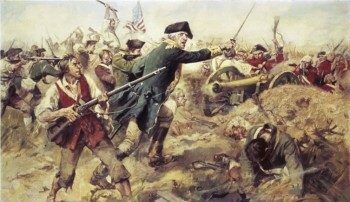 The Battle of Bennington was the first decisive victory for the Americans and rallied more Americans to the Rebel cause. After this major setback for the British, Burgoyne took up headquarters at the home of Judge William Duer, who had abandoned his Fort Miller home to serve the Rebels as a commissary. Burgoyne would remain here more than a month while his supplies—delayed by lack of horses and oxen—were stockpiled. Once a 30-day ration of supplies and munitions was prepared, his army crossed the Hudson River by constructing a bridge of boats. Orders were orders. In spite of the odds, Burgoyne decided to push on. Battle with the Rebels, now entrenched at Stillwater, was looming. The Fort Miller Pocket Park (which is technically in Greenwich) has pull-offs on both sides of the road. As you’re driving south, pull off on the right hand side. You will be parked on the eastern bank of the Champlain Barge Canal. 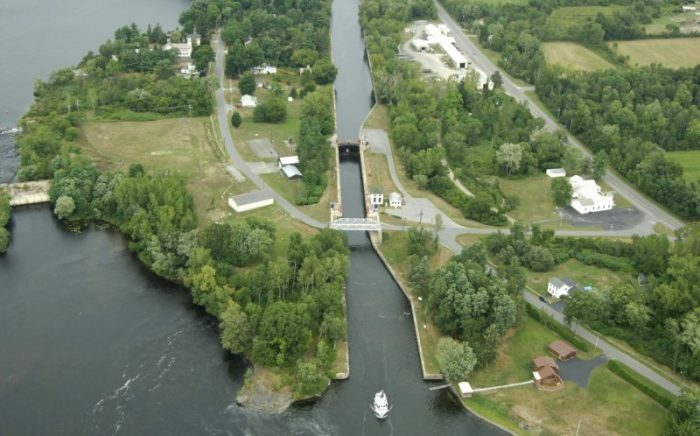 The Old Champlain Canal was located on the opposite side of the road, but when the barge canal was expanded to accommodate modern freight in the early 20th century, the route was altered, creating a man-made island (Galusha Island) connected to the mainland by three one-lane bridges. The Duer House no longer exists. A historical marker on Route 4 points a quarter mile eastward to the former location of the home. Just south of the pocket park, is Lock 13 of the Old Champlain Canal (behind the Tymetal Corporation building.) Here, on the west side of the Barge Canal (on Galusha Island) is the Fort Miller Reformed Church. Play Part 1 of Track 25 while you’re at the Pocket Park. Start Part 2 of Track 25 as you leave the pocket park.